Often I get asked to design things which require displaying of products and I don’t yet have the images. I’ve written a script to do just that. If you’re not a PHP coder and don’t want to tweak the code and run it yourself bug just want a zip with 100 – 600 random images – here it is. I needed some filler in a test site and found using the same image for all products doesn’t help prove that the solution will work. What I needed was a 100 (or 600!) meaningful(ish) jpgs. This script produces just that with random background colours and contains a number. 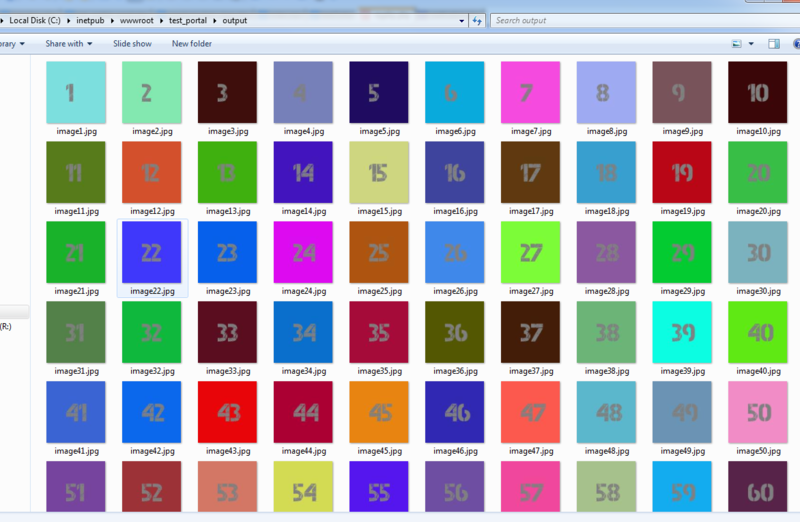 Here is the output – the colours please me greatly. Useful for filler for beta sites. Remember if you’re using PHP on Windows to check your php.ini file that extension=php_gd2.dll is enabled. I’ve commented about the font used but you will have to amend these lines. The script actually outputs the last image for testing though in some other use you might just want some confirmation text – remove the header gubbins. define(‘IMAGE_DIR’, ‘./output/’); // change this. // generate a rand background colour – note no protection to avoid grey backround with grey text. //replace with your own font or use a windows standard one (e.g. point it at c:\windows\fonts) – i like the capture_it font.